Around the world, black handprints are appearing on doorways, scorched there by winged strangers who have crept through a slit in the sky. In a dark, dusty shop, a devil’s supply of human teeth grows dangerously low. And in the tangled lanes of Prague, a young art student is about to be caught up in a brutal otherworldly war. Meet Karou. She fills her sketchbooks with monsters that may or may not be real; she speaks many languages—not all of them human; and her bright blue hair actually grows out of her head that color. Who is she? That is the question that haunts her, and she’s about to find out. And so begins the magic, elegance, beauty, romance and heartbreak that is Daughter Of Smoke And Bone. I have never, ever been so spellbound by a book. I first read this in January, and until the day I picked it up for a reread, I have not been able to stop thinking about it. This book is going to stay with me for a long, long time, I know. Take everything you know about YA fantasy. All the myths, magic, perceptions of Good Vs. Evil. Every cliché, every over-used plotline. Now throw it all away. 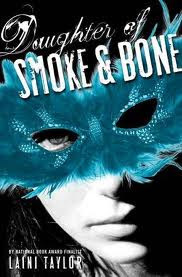 Daughter Of Smoke And Bone is like a breath of fresh air in a stagnant genre, like a whiff of some exotic, wonderful scent carried on the wind. It is richly detailed and realized, with the kind of prose that makes you forget you’re reading a book and transports you to the streets of Prague, where a blue-haired girl with monsters for a family meets a beautiful, vengeful angel. There are some books so good you fly through them, tearing through the pages like a kid with a cereal box, waiting for the prize at the end. Then there are the much rarer books that defy all standards of “good”, books you can’t even contemplate finishing in mere hours. You have to savor each and every page, drink in the description and dialogue and characters, set it aside so you can let the wonder you’ve just read sink in before picking it up again and continuing. Books so astounding that it would be a crime to give only a single afternoon to it. Without a doubt, Daughter Of Smoke And Bone is one of the latter books. I loved everything about this book. Everything. 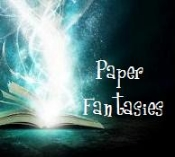 From the fairy-tale –esque Once Upon A Time openings, to the flowing descriptions to the all-encompassing romance, right down to the ending that was as torturous as it was compelling. I loved Brimstone and the chimaera, the monstrous beings that are far from monsters, and how we are first introduced to them through Karou’s sketchbook. I loved the turn this book took toward the last quarter, and all the implications it left open for Days Of Blood And Starlight. The only thing I didn’t like was the agonizing wait for book two. A wait that is coming to an end, leaving me bouncing in my seat, anxious and excited and all out of patience to return to Karou and her fantastical life. To return to Akiva, my tortured angel who has been seared into my brain and wanders my dreams at night. I could search my mind all day for the right words to describe my feelings about Laini Taylor’s masterpiece and still come up short, so I’ll just leave you book-lovers with one of the best pieces of reading advice you’ll ever get—if you haven’t already, read this book. You can thank me when you’re finished. Daughter Of Smoke And Bone; easily 5 out of 5 stars. I know! I have been going crazy waiting lol. What a review! How could anyone read this and not race off to Amazon to click buy! Thanks so much, Trish! Your comments always make my day! *squee* Yayayayayayay!!!! You'd better love it!!!! Though there's not much doubt in my mind that you will lol. Wow! What a great review! I can't wait to read this book now! Definitely makes me want to run to the store and get it! Following you now :) Would also love it if you checked out my blog! Thanks, Tina! Trust me, you will love it when you get around to reading it. Laini Taylor can do no wrong in my eyes, her writing is AMAZING. Join My Awesome GFC Followers! Kelly has read 9 books toward her goal of 60 books. Kelly W. Picture Window theme. Powered by Blogger.